When it comes to breast cancer, early detection is the closest thing to a cure. Reducing radiation exposure from a mammogram is always recommended for those most at risk. The term “preventive breast screening” is a little misleading in that it’s more about detection than stopping breast cancer from happening in the first place. There are means to make cancer less likely, such as maintaining a healthy weight, regular exercise, limiting alcohol intake, eating nutritious food, and never smoking (or quitting). But genetics, personal health histories (prior cancer diagnoses) and environmental factors beyond the control of the patient can cause cancer nonetheless. That said, early detection leads to cures while late detection puts the patient in a much more difficult situation. That is why leading health organizations strongly urge women (and some men) to be vigilant in identifying breast cancer in the earliest stages possible. This speaks to the somewhat varying levels of risk to different age groups. It also indicates that those women with dense breasts – which have less fatty tissue and more fibrous and glandular tissue – have a higher rate of cancer, and those cancers are harder to detect. According to BreastCancer.org, “Dense breasts…can be 6 times more likely to develop cancer … [density] can make it harder for mammograms to detect breast cancer…breast cancers (which look white like breast gland tissue) are easier to see on a mammogram when they’re surrounded by fatty tissue (which looks dark). All organizations recommend mammograms, although there is some debate on how young a woman of average risk should start (before or after age 50?). The downside is that radiation exposure in mammograms can increase breast cancer formation in a small percentage of women. This was identified in a study published in 2009 in the Journal of the National Cancer Institute, which specifically looked at young women (20s and 30s) who have the genetic mutation for breast cancer risk. “Exposing the youngest of these women to even small doses of radiation via screening mammograms might do more harm that good,” says an article about the study published by the University of California San Francisco, a major medical training and research institution. For older women as well, radiation exposure in mammograms is concerning, particularly because some women get a mammogram once every one or two years. 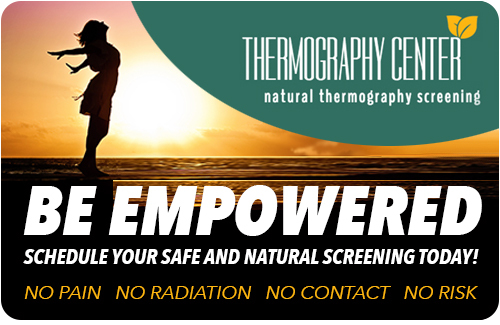 Some instead choose an adjunct method of early detection that does not involve radiation, which is thermography. This non-invasive tool measures slight upticks in temperature that occur when tumors form (keeping in mind that tumors are growing things; as they grow, they require an increased supply of blood which raises the temperature around the tumorous tissue). A patient who identifies some risk with a thermography test is advised to then proceed with a mammogram and other diagnostics as her physician recommends. In so far as thermography does not increase the patient’s radiation exposure, it might be considered a preventative.